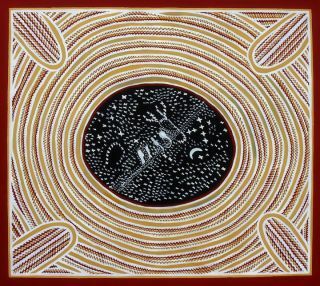 A star map painting by Bill Yidumduma Harney, senior elder of the Wardaman people, featuring the Milky Way, the moon and ancestor spirits. The International Astronomical Union has unveiled new official names for 86 stars in the sky. Tahitian myth, South African nicknames, and ancient Chinese and Hindu titles for lunar mansions are among the inspirations for the new names of 86 stars in the Earth's night sky, astronomers said. Modern star catalogs identify billions of stars through designations that are strings of letters and numbers indicating each star's position or order. However, more-colloquial and memorable names for the brightest and best-known stars are often approved by the International Astronomical Union (IAU), the world's largest professional astronomical society. "The Working Group on Star Names provides an avenue for these ancient cultural star names to be woven into the tapestry of modern-day star catalogs and star atlases, and to point skywatchers to new and unfamiliar stories in the sky from their fellow human beings from other parts of the world, talking to them from across the centuries," said Eric Mamajek, chair and organizer of the working group. "The purposes of the naming of the stars have ranged from representing mythological figures and animals, to [identifying] important stars useful for timing harvests, to navigating the immense Pacific Ocean, to providing pilots and astronauts with names for bright navigational stars during the 20th century," Mamajek told Space.com. The new star names include 11 Chinese star names, with three of those coming from "lunar mansions," vertical strips of the sky that astronomers used to mark the nightly progress of the moon, a bit like the zodiac. The new names also include two ancient Hindu lunar mansions: Revati and Bharani, for the stars designated Zeta Piscium and 41 Arietis, respectively. Four new stars names that were drawn from Aboriginal Australians are some of the most ancient star names on the new list, as Aboriginal Australians are among the oldest continuous cultures in the world, going back more than 65,000 years. The name Unurgunite for Sigma Canis Majoris comes from an ancestral figure among the Boorong who fought the moon, while the names Larawag, Ginan and Wurren for the stars designated Epsilon Scorpii, Epsilon Crucis and Zeta Phoenicis, respectively, come from the Wardaman people. "For the Wardaman people of Australia, some of the names are part of their song lines, oral mythologies of creation passed on from generation to generation," Mamajek said. The brightest star with a new name is now called Alsephina, assigned to the star designated Delta Velorum. The name stems from the Arabic name "al-safinah," meaning "the ship," referring to the ancient Greek constellation Argo Navis, the ship of the Argonauts. Numerous stars have names with Greek origins that were translated to Arabic and then to Latin during the Middle Ages or the Renaissance. Among the nearest stars to the sun, the IAU's Working Group on Star Names recognized the name Barnard's Star, which has been in common use for a century. The name refers to a red dwarf star discovered by astronomer Edward Emerson Barnard in 1916 that lies only about 6 light-years away from the sun, just a bit farther away than the sun's closest neighbor, Proxima Centauri, which lies just 4.2 light-years from Earth. One reason the IAU formally catalogs names is to avoid the confusion that has arisen over the centuries as different cultures and astronomers have given their own names to stars. Until recently, some of the most famous stars in the sky had no official spelling and even multiple names, and identical names were sometimes used for completely different stars. For example, there were 30 names for the star commonly known as Fomalhaut, including Fom-al hut al-jenubi, Fomahandt, Fomahant, Fomal'gaut, Fomal'khaut, Fomalhani, Fomalhut, Formalhaut, Fumahant, Fumahaut and Fumalhaut. In another example, two bright stars — Epsilon Cygni in the northern constellation Cygnus and Gamma Corvi in the southern constellation Corvus — have both been known for centuries as Gienah, from the Arabic "al janah," meaning "wing." To reduce confusion, the name Gienah was retained as the name for the star Gamma Corvi, and Aljanah was approved for Epsilon Cygni, in keeping with its original name. The IAU's Working Group on Star Names consists of a group of IAU members from around the globe who review star names from star catalogues, sky atlases and other sources. The group votes on what names stars should get, "and sometimes names do not get approved," Mamajek said. "There are some bright stars currently lacking IAU names approved by the Working Group on Star Names, and I can say that those are already reflecting some cases where names were not approved, despite their use in some astronomical literature in recent decades." The IAU announced the 86 new names on Dec. 11. More names from indigenous American, African, and Australian cultural traditions likely "will be included in the IAU catalog over the next year or so," Mamajek said. Follow Charles Q. Choi on Twitter @cqchoi. Follow us @Spacedotcom, Facebook and Google+. Orginal article on Space.com.